This research study involved the use of extensive secondary sources, directories, and databases such as Hoovers, Bloomberg Businessweek, Factiva, and OneSource to identify and collect information useful for a technical, market-oriented, and commercial study of the global pneumatic conveying systems market. Primary sources are mainly industry experts from core and related industries, preferred suppliers, manufacturers, distributors, service providers, technology developers, standard and certification organizations of companies, and organizations related to all the segments of this industry’s value chain. The points given below explain the research methodology. After arriving at the overall market size, the total market has been split into several segments and subsegments. 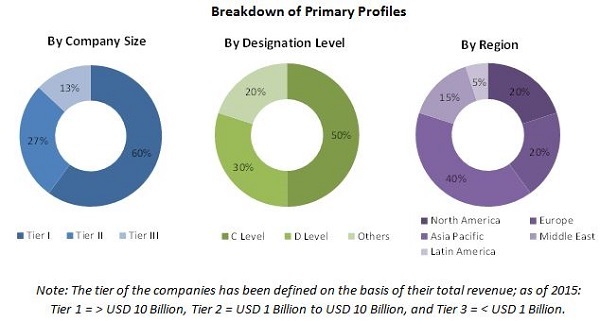 The figure given below shows the breakdown of primaries on the basis of company type, designation, and region, conducted during the research study. 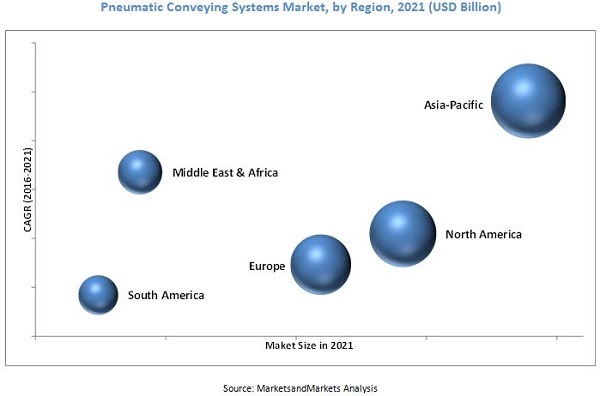 The ecosystem of the global pneumatic conveying systems market starts with the manufacturer of basic components, such as valves, bearings, motor, engine, blowers, hoppers, pipes, silos, and compressors among others. The manufactured parts are then assembled by the OEM (Hillenbrand Inc. (U.S.), Nilfisk Group (Germany), Schenck Process Holding GmbH (Germany), Zeppelin Systems GmbH (Germany),and so on) to form a pneumatic conveying system, which is then tested. This stage is followed by the installation stage, at the end-users facility. The global pneumatic conveying systems market is projected to reach USD 7.04 Billion by 2021, growing at a CAGR of 6.4% from 2016 to 2021. This growth can be attributed to growing demand for advanced and energy efficient pneumatic conveying systems and growth of emerging economies. Pneumatic conveying systems are principally used to transport materials like powders, pellets, and granules from source to destination using pressure conveying or vacuum conveying methods with efficiency and with minimal loss. This method helps to transport a wide variety of materials in various industries like food, pharmaceuticals, power generation, metals, mining, and ceramics among others. This has led to the increasing installation of pneumatic conveying systems across industries. The positive pressure conveying system segment is estimated to dominate the pneumatic conveying systems market, by technology. The demand for positive pressure system is fueled by its wide range of application and the growing demand for efficient transportation of materials over long distance. Rapid industrialization in growing economies such as India, Saudi Arabia, UAE, South Africa, and Brazil, and high demand for processed food are also likely to be among the major driving factors. Moreover, the growth of industries such as food and beverage, manufacturing, power generation, pharmaceuticals, pulp and paper, and chemicals and petrochemicals, is also expected to boost the demand for these pneumatic conveying systems. The Asia-Pacific is estimated to lead the pneumatic conveying systems market, in terms of growth rate as well as market size, from 2016 to 2021. High growth in the power generation, food and beverage and pharmaceuticals sectors and new and proactive policy reforms to support the growth of the manufacturing sector in India and China are key factors driving the market in this region. U.S. is estimated to be the largest market globally, and is set to grow at promising CAGR from 2016 to 2021. China is expected to follow, registering the highest growth rate during the same period. Countries such as the U.K., the U.S., Germany, and France are investing in cleaner and renewable power generation methods. This has reduced the demand for pneumatic conveying systems in the power generation industry. Furthermore, falling metals and mineral prices has led to reduced investments in metal, minerals & ceramics industry which is expected to affect the demand for pneumatic conveying systems and reduce the market growth. For instance, the industry witnessed 19.6% fall in revenues from 2014 to 2015 and 2.3% fall in 2014 from 2013. This has impacted growth of new mineral plants across the world. Leading players in the pneumatic conveying systems market are Hillenbrand Inc. (U.S.), Nilfisk Group (Germany), Schenck Process Holding GmbH (Germany), Zeppelin Systems GmbH (Germany), and KC Green Holdings. Contracts and agreements is the strategy most widely adopted by players in the pneumatic conveying systems market. 11.4 Schenck Process Holdings GmbH. 11.6 KC Green Holdings Co. Ltd.